This is an edited version of my article published in Food & Wine Journal (quarterly), September 2013. Blinking in the bright sunlight, having emerged from the long dimly lit Sóller road tunnel, motorists see a roadside sign announcing their arrival in the ‘Valley of Oranges’. The sign is hardly necessary: for a large part of the year it’s impossible to miss the profusion of citrus fruit trees – laden with oranges or lemons – growing in Mallorca’s Sóller Valley. Given the importance of citrus fruit to the local economy, it’s not surprising that this area is also known as the ‘Valley of Gold’. In the handsome town of Sóller and nearby Port de Sóller, every bar, café and restaurant takes advantage of the delicious oranges grown on more than 120,000 trees in the vicinity. Visit in the first two weeks of June and you’ll even find a fiesta dedicated to oranges – the Fira de La Taronja – when the fruit takes the starring role in the festivities, and local restaurants create special dishes using oranges. Oranges (and lemons) have brought fame and fortune to Sóller. The history of citrus cultivation here goes back to the 11th century, when it was introduced by the Arabs, who were in occupation. They recognised that this sheltered valley in the west of Mallorca – protected by the UNESCO World Heritage Site mountains – offered the perfect growing conditions for citrus trees, with water in abundance. 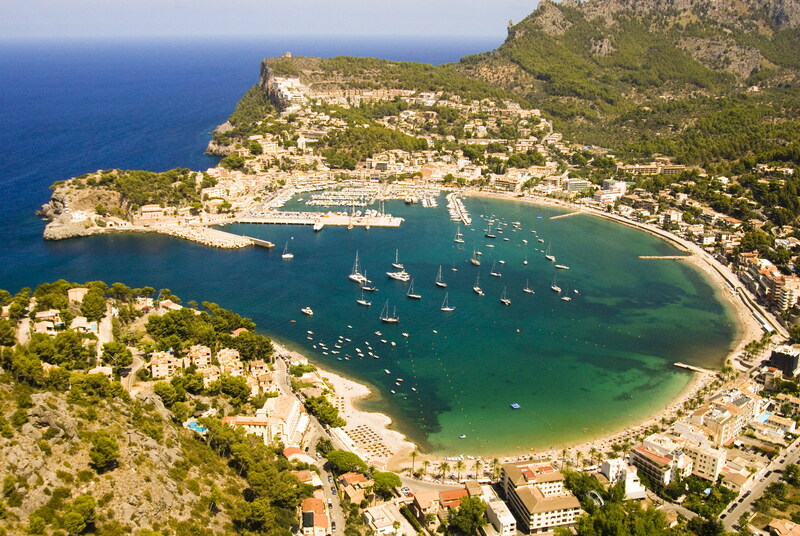 The French Revolution prompted many people to flee France, and Mallorca became a refuge. The exiles sailed into Port de Sóller and it wasn’t long before they were sending shipments of the delicious oranges they discovered here back to France – which became an important market for Sóller’s citrus fruit. But in 1860 serious pest damage decimated the orange plantations and many local people were forced to leave the island to find work, travelling to France or Latin America. Others stayed to re-stock their plantations. When the islanders eventually returned to Sóller, their new wealth enabled them to build impressive properties, which reflected the architecture of the countries where they’d been working. There are Colonial influences in some of the grand urban mansions but, most evident, is the legacy of time spent in France: Sóller has more Art Nouveau (Modernismo, in Spanish) architectural style than anywhere else on Mallorca. To this day, the town still has something of a French feel about it. The reason that Sóller’s oranges were shipped from the nearby port was the mountain range, which effectively isolated the valley from the rest of the island: the only overland route was a twisting dirt track over the vertiginous Coll de Sóller mountain. This changed in April 1912, when a narrow-gauge railway service started between Sóller’s new Art Nouveau railway station and Palma – funded by the citizens of the valley town. It had taken five years to construct the 27-kilometre track, which involved excavating 13 tunnels through the mountains. Competition from Israel and southern Spain eventually reduced the export market for Sóller’s oranges, causing a downturn in the area’s economy. But fortunes began to change again in the late 20th century . . . as you’ll read next time. That photo is sooooo inviting! Someone please take me there now! It’s a really beautiful place – and well worth a visit! I hope you get here to see it one day. Thanks for stopping by my blog. What a breath-taking setting. Enjoyed your blog. a visit if you make it to Europe. Thank you for your kind comments, Kelvin. I hope you’ll keep reading. Thank you! I would start with a free platform – I have been happy with WordPress. You can always upgrade to a paid site if you enjoy blogging. I know quite a few people who start blogging, full of enthusiasm, but give up for varios reasons. Shame to spend the money until you know whether you want to keep going. Best of luck with your own blog! Previous PostWho needs pizza when Mallorca has coca?